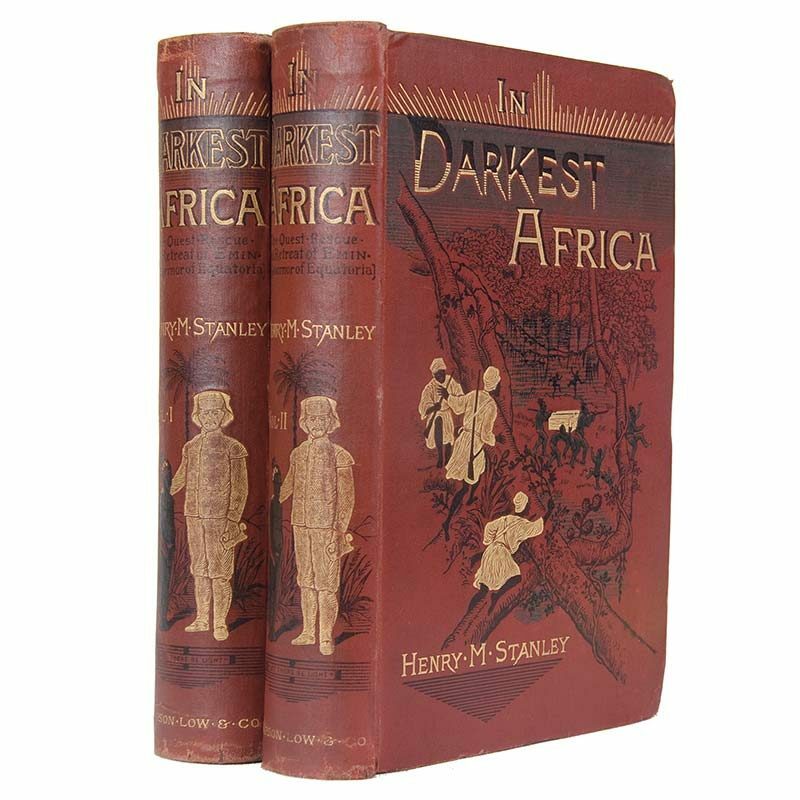 STANLEY, Henry M. In Darkest Africa, or the Quest Rescue and Retreat of Emin, Governor of Equatoria. With one hundred and fifty woodcut illustrations and maps. In two volumes. London: Sampson Low, Marston, Searle and Rivington, 1890 8vo. (1). xv,529pp. 15 plates, numerous text-illustrations, coloured lithographed folding map, index.(2). xv,472pp. 23 plates, numerous text-illustrations, 3 coloured maps, (2 folding), index. Sir Henry Morton Stanley (1841-1904) African explorer, journalist and Member of Parliament was persuaded by the shipping magnate William Mackinnon late in 1886 to lead an expedition to relieve Eduard Schnitzer, known as Emin Pasha, the beleaguered governor of equatorial Sudan. ‘The advance party of just under 400 men, led by Stanley, set off for Lake Albert on a 450 mile journey of over five months through the Ituri rain forest. Stanley’s descriptions of the tortuous passage through the dense forest rank among the most celebrated of all his writings.’ – ODNB. Both volumes carefully recased, occasional spotting in the text, repairs to folds on the two large maps, a very nice set of the first edition in the publisher’s brick red decorated cloth.